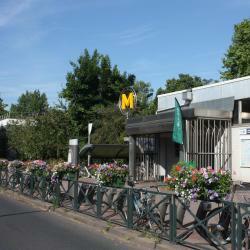 Looking for hotels near Châtillon-Montrouge Metro Station? Chatihotes is located in Châtillon, on the outskirts of Paris and provides a self-catering accommodations with free WiFi access. You can relax on the terrace while enjoying the garden views. Located in the south of Paris, Comfort Hotel Sixteen Paris Montrouge is located just 2297 feet from Mairie de Montrouge Metro station and offers free WiFi. Cécile et Benoit is located in Malakoff, a 5-minute walk from the city hall. The guest house features a garden and a small terrace. Guest can use free Wi-Fi access on site. Les Coquelicots is located in Montrouge. All rooms have a flat-screen TV with satellite channels and a private bathroom. Facilities include a terrace and free WiFi is accessible. Located in the South of Paris, just 8.1 mi from Orly Airport, Novotel Suites Paris Expo Porte de Versailles is a few yards from Porte de Vanves Metro Station, which leads directly to the city center. Okko Hotels Paris Porte De Versailles is located 2297 feet from Paris Expo - Porte de Versailles Exhibition Center and 1.7 mi from Parc des Princes It offers air-conditioned accommodations with free... Super clean with ftiendly staff that were always willing to help. In the lively Montparnasse district, this contemporary hotel is 300 yards from Pernety Metro Station. It has a sauna and guest rooms feature unique artworks and a flat-screen TV. The staff was extremely gracious & accommodating. Located in the South of Paris, just 8.1 mi from Orly Airport, Novotel Suites Paris Expo Porte de Versailles is a few yards from Porte de Vanves Metro Station, which leads directly to the city center. Hotel is very clean, nice cozy beddings, over interior of the room was modern. Le Glam's Hotel is located in Paris, 886 feet from Porte d’Orleans Metro and Tram Stations. It offers rooms with colorful décor and free Wi-Fi access. Staff was very welcoming and helpful! The room and bed was comfy and exceptionally clean! Mercure Vaugirard Paris Porte De Versailles is located opposite the main entrance to the Porte de Versailles Exhibition Center. The room and its view were amazing. My daughter loved the kids area in the lobby. Hotels with great access to Châtillon-Montrouge Metro Station! Max Hotel is a boutique hotel in the 14th district in Paris, just under half a mile from Parc Montsouris and 2 miles from Porte de Versailles Exhibition Centre. Great atmosphere, very friendly staff, nice stay. Set in a 20th-century building in central Paris, Chouette Hotel is just 1312 feet from Georges Brassens Park. The Porte de Versailles Exhibition Center is 0.9 mi away. Perfect location to explore Paris, close to public transport. Located 0.9 mi from Porte de Versailles Exhibition center, opposite Georges Brassens Park, Hôtel du Home Moderne offers contemporary rooms with free Wi-Fi internet access. The staff was very helpful and welcoming. They were always going beyond to help. Ideally located just 328 feet from Mairie d'Issy Metro Station, Paris d'Issy Hôtel Porte de Versailles offers a 24-hour reception, free WiFi access throughout and a courtyard with outdoor furniture. The staff was extremely helpful! They went out of their way to help us out with various needs. In Paris, Hotel Acropole is close to the Porte de Versailles exhibition center. It offers accommodations with free Wi-Fi and flat-screen TVs with satellite channels. Beds were comfy, shower/bathroom were excellent, staff was helpful, would highly recommend!